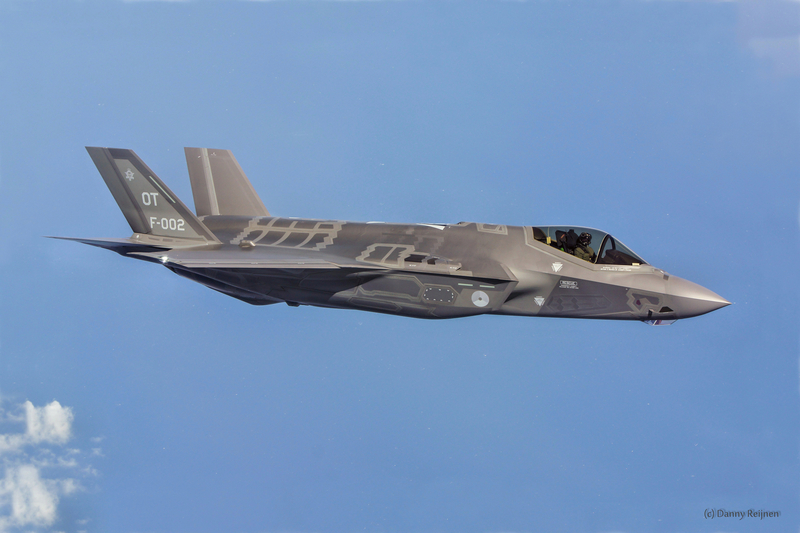 The Dutch Parliament approved an order for eight Lockheed Martin F-35As in March 2015, confirming the aircraft as the official replacement for the F-16 for the Royal Netherlands Air Force (RNLAF). 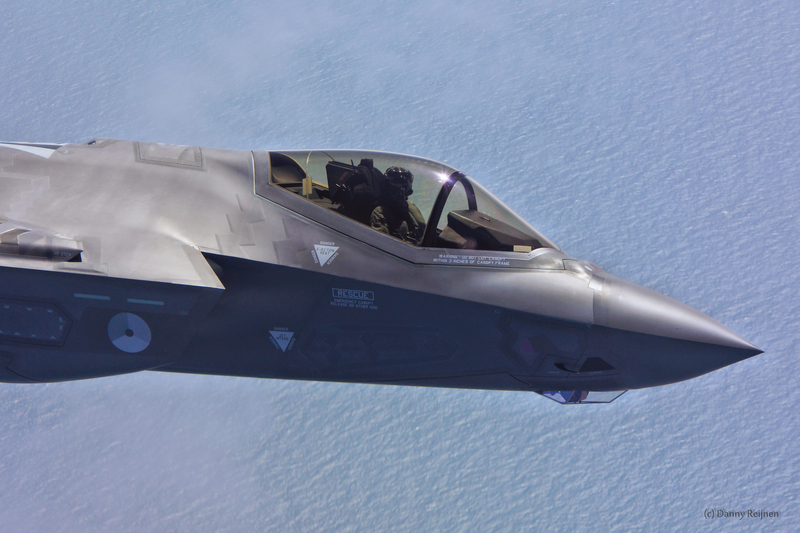 This lot of eight F-35s will be delivered in 2019. The current program of record for the Netherlands is for up to 37 aircraft. 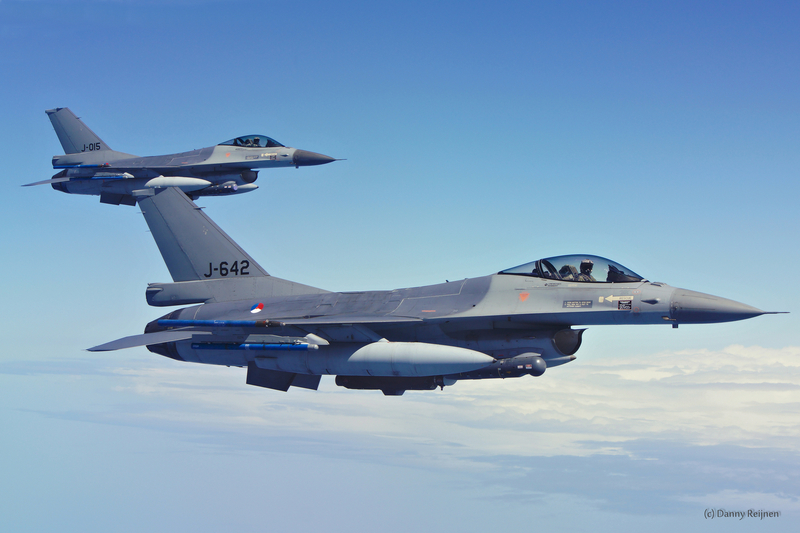 Currently, there are two Dutch jets flying and four Dutch pilots who have completed training, along with several trained maintainers. 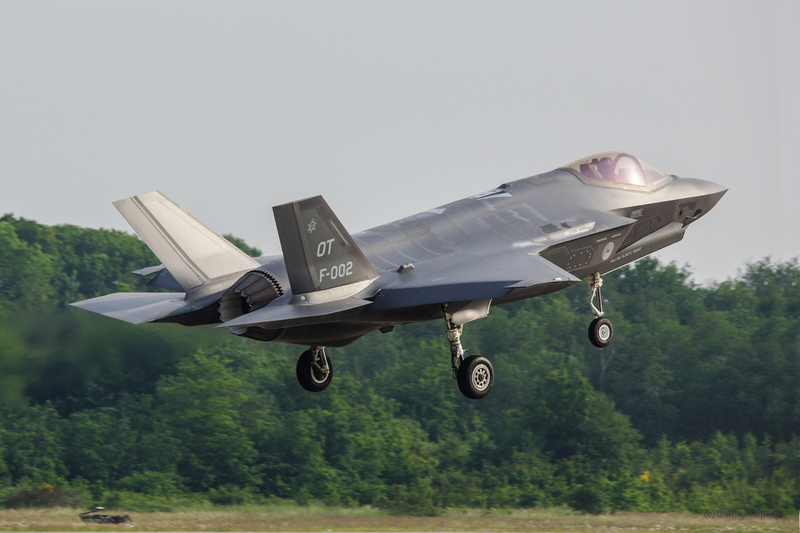 On the 23th of May 2016, the first two Dutch F-35A aircraft, AN-1 (F-001) with about 370 flying hours and AN-2 (F-002) with about 340 flying hours, have arrived at Leeuwarden air base, in the Netherlands, at the end of the type’s first eastbound transatlantic crossing. 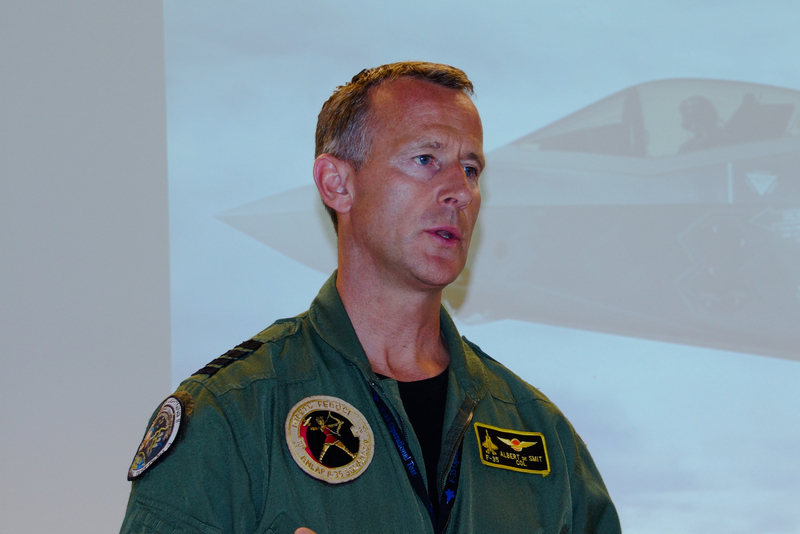 Pilot’s Colonel Bert “Vidal” de Smit and Major Pascal “Smiley” Smaal conducted a fly by for nearly 2,000 base members, dignitaries and media before touching down. The Dutch Minister of Defence Jeanine Hennis-Plasschaert was the first person to greet the two crew members. Their arrival was broadcasted live to the entire country. 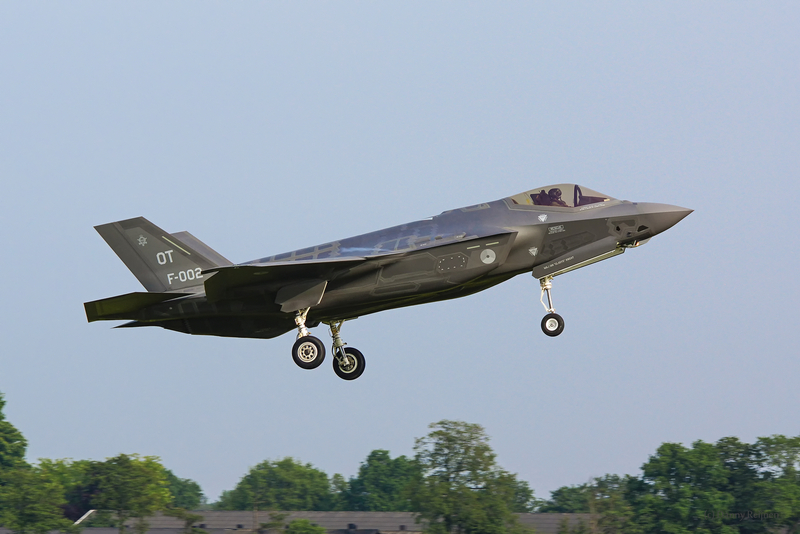 In 2015, the Dutch Minister of Defense made a commitment to do everything in her power to bring an F-35 to the Netherlands, as a means by which to remove concerns of residents in the areas of Leeuwarden and Volkel and to allow local residents experience the sound of the F-35 while also affording them the opportunity to voice their opinions. On the 26th of May 2016, these flights were successfully performed in the areas close to the airbases at Volkel and Leeuwarden. 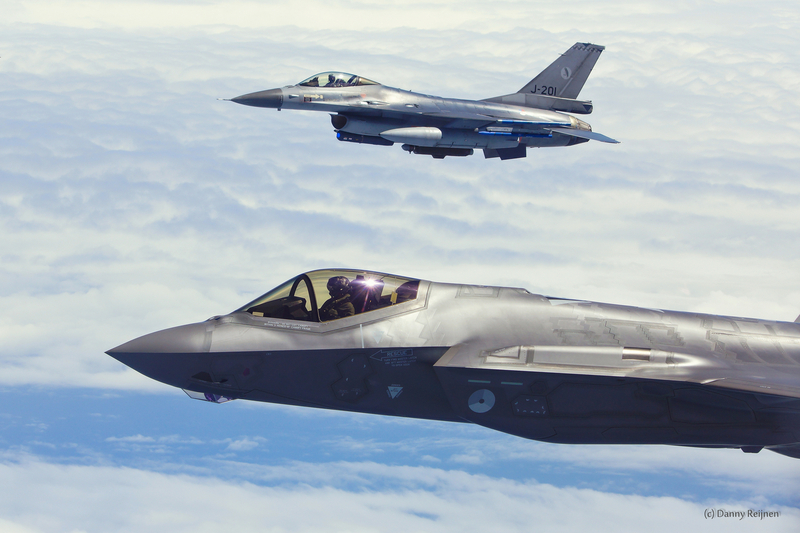 The F-35 flew in the afternoon and early evening, including an afterburner take-off, which was requested by the residents, the F-35 flew profiles alongside an F-16 – as they would normally do from both bases. The aircraft flew 28 sorties in order to give the local residents suffice opportunity to experience exact noise levels. 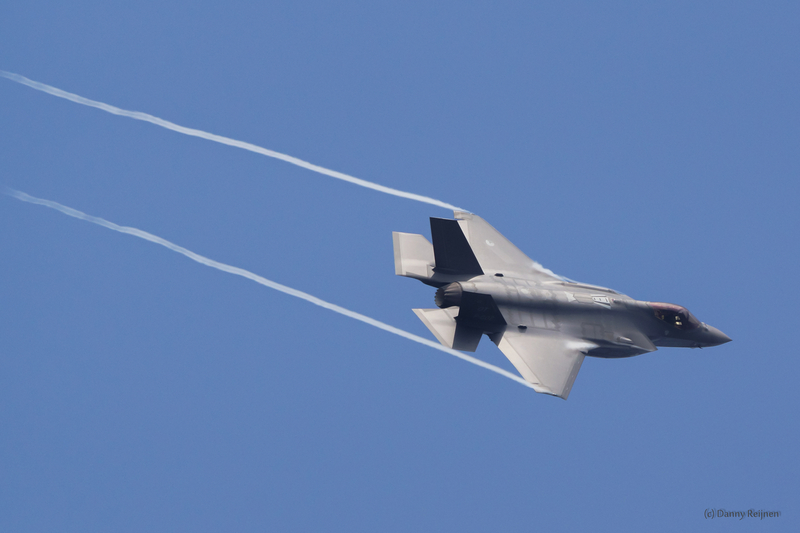 The peak levels of the noise produced by the F-35 were measured on different locations in the neighbourhood of both airfields and were about 3 db higher then the peak level of the F-16. In an interview with Colonel de Smit, de Smit stated that if the planes were in Holland just for the noise flights they would be done in three days. Because the Dutch airfields have hardened shelters and, in the United States, the planes are operating out of sunshades, this is the perfect opportunity to perform tests with the planes in hardened shelters. 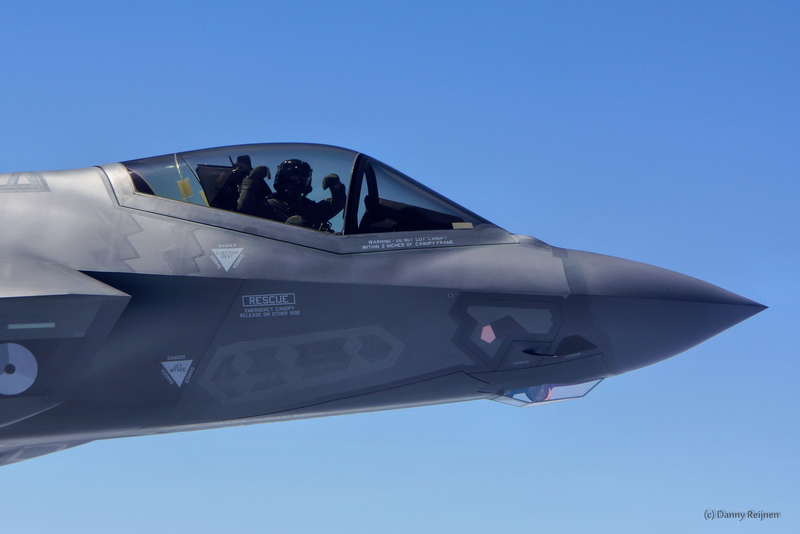 This because the F-35 has more power then the F-16 which could develop more vibration in the shelters and could damage the shelter and plane, in worst-case. 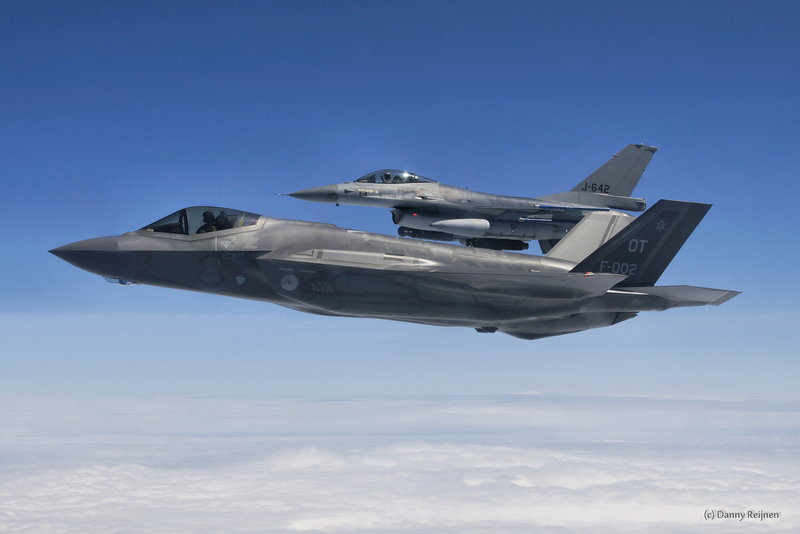 “The time that the F-35’s are in the Netherlands, the Airforce is testing their equipment, their logistics and, of course, the planes. If problems occur, this is the time to discover problems and solve the problems before the planes arrive in 2019 ”, de Smit stated. 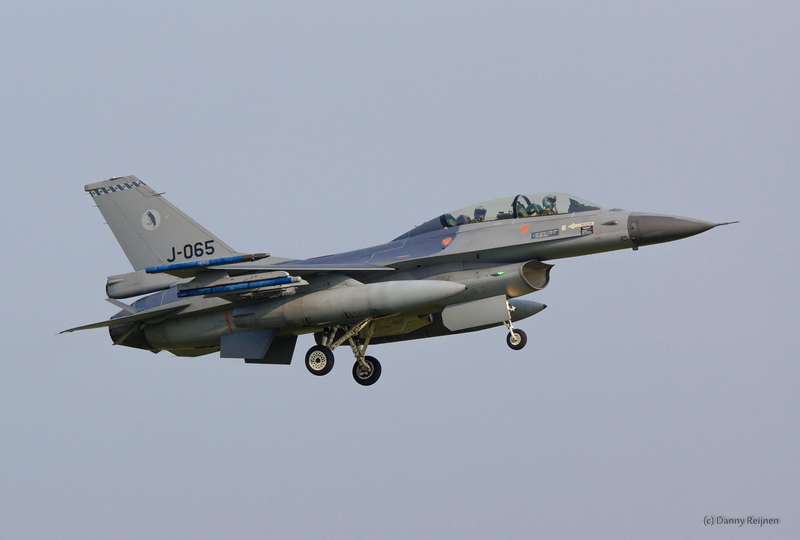 During the next three years the Netherlands will prepare for a total of 37 aircraft permanently based, starting with Leeuwarden Airbase in 2019 and then Volkel Airbase in 2021. Danny Reijnen was born in Nijmegen, the Netherlands and currently resides in Almere in the Middle of the Netherlands with his girlfriend Susan and 4 kids. Danny currently works for the Ministry of Defence at Schiphol Airport. His passion towards military aviation started when he was 7 years old. His dad took him to Volkel airbase. There he saw a lot of F-16s flying and he got hooked. 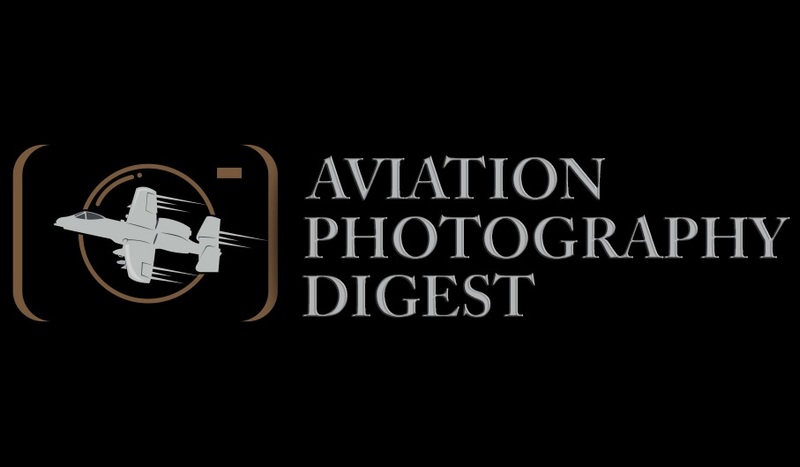 He has been active in aviation photography since 1993. When he first began, he was using an analog film camera. After awhile he got his first digital Konica Minolta 7D. After a couple of years the camera needed to be replaced and he bought a Sony A700. In 2015, he purchased a Sony A77 while continuing to use A700 as a secondary camera. Despite of having a busy job, and being interested in taking photographs, Danny recently started to put his talent to use as a photojournalist in military aviation.